Ok, I admit – the sun is waking up a bit later these days, and the leaves are beginning to take on a yellowish cast that suggest a certain malaise with the whole summer season. It’s like they’re waiting for permission to fall – they’ve upheld their end of the bargain for months. And it’s certainly cooler and quieter in the darkness of the morning, though the stars have been amazingly enthusiastic in appearance. But last I looked it’s still summer in this part of the world, and dammit, I’m not ready to call it over. So why are the supermarkets starting to sell Halloween candy? Why am I seeing store sales for sweaters and jackets when the mere thought of such encumbrances makes me break out in a full-blown glow that requires showering in the middle of the day? And most importantly, why oh why do I have to hear, read, watch political ads in every possible media forum available? I’m sorry – I don’t find any of it fascinating, because I question the veracity of every assertion. I’m crossing every party line when I write this – for though it would seem that much of the population enjoys the divisiveness, attack ads, accusations and vitriol – perhaps I am a minority of one. I don’t know what will bring us together when so much time is spent fueling disparity and hostility. I’ not naive, I know politics isn’t a nice business – it just seems to get uglier to me though. Perhaps it’s because it is a process that seems never-ending, or maybe it suffers from the absence of the gentler winds of summer. I tire of verbs like ‘pandering’, adjectives like ‘ineffectual’, comments that suggest that we are so far behind the eight ball there is nothing left for which to be proud and strong. So, if I could paint the world in my colors, there’d be fewer primary colors right now (pun intended). There’d be a more effusive use of pastels, with striking, unequivocal hues left for the issues which unite humanity. Ah, this is a throwback from my love child days I guess. I want my own crayons thank you very much, and I want to paint a gentler backdrop for our conversations to continue. Yes it’s naive, even childish – I’ll own it. But given this flight of fancy on these waning summer days, what would you draw? What would you give the world that it could cherish and elicit a smile, a laugh? If we started from a place of similarity and hope. As you picked up your Crayola box, with all those brilliant colors all sharp and ready for your imagination to color the world. It’s your mural – what would you like it to reflect? Mine would be full of light and wishes and a lousy attempt at drawing fireflies. It would have children of all shapes and sizes and talents and colors. I’d color doors that are open. And I would send a message up to the sky asking for a little more kindness, a bit more humor and a little more time. It’s your turn – what’s on your easel? Posted on August 30, 2012 by mimijk •	This entry was posted in discretion, friendship, humor, inspiration, life lessons, love, mindfulness and tagged Crayola, perspective, Robert Fulghum, unity. Bookmark the permalink. With your anti-primary color stand; I take it the Green Party has no appeal? Lol..can we paint in gentler colors than garish green Keith? Oh, Mr. Fulghum. Your Crayola bomb offers such a delightful image. 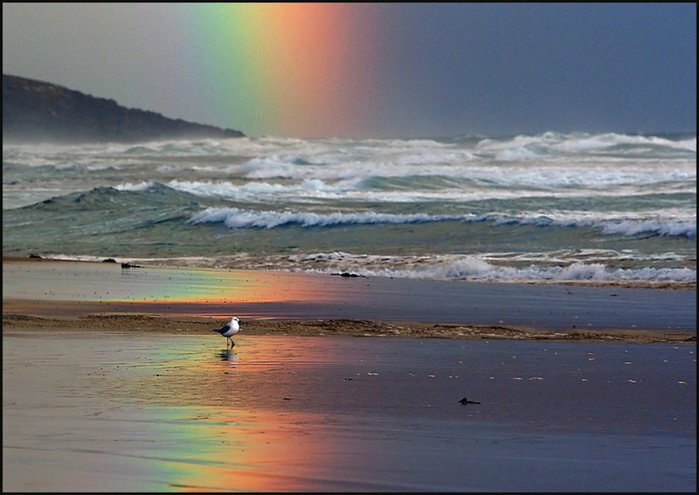 I smile at the thought of colors and happiness raining down upon our world. Thanks for this, Mimi. It made my afternoon. Lori, that’s an absolutely perfect picture. And me too! loved that big box with the sharpener. What a treat! Completely on board with you here Mim…I swear, my TV has been silent more these last weeks then ever in it’s entire life. I despise this negativity on all sides and refuse to listen to one more second of it. They ALL DESERVE each other, it’s just a damn shame we have to live with the consequences. Any waaaaaay, my mural would be full of everything that makes my heart sing and want to dance in the rain. So, if it’s coming from me, and there’s rain on the horizon…it’s A GOOD THING! I am. and I pay NO ATTENTION to the lines! I’m with you Mimi (on political process)…sad so much energy and money seemingingly wasted. Honestly? It depresses me..I feel like there’s this weight in the air, making every action so challenging. And it embarrasses me – this is the best we have to offer in the name of our political process – seeing how ugly and disingenuous we can get? Yes. I used to watch many political shows on both sides of the aisle (12 months ago – pre-blogging). I shut it down. I found it to be depressing as well. Me too (stopped watching that is). I vote for a change. PURPLE. Red states and Blue states…blended together for America’s sake…of course with slight differences…lavender, purple, violet, orchid, burgundy. I love your crayola box Carrie..all those gorgeous shades of purple…delicious! Me too!! I wish my kids were still in school just so I could get the supplies!! I loved all of it – the glue sticks, the crayons, markers., notebooks..sigh.. Yes! We must have puppies!!! I am so enervated by these ads and calls and ugliness. Maybe it’s just getting older, but I don’t remember so many ads filled with such aggressive disdain. It almost feels like somewhere in the country people are rallying for a divided, perpetually angry nation and it makes me so sad.. Negative ads drive me crazy! Just tell me what YOU stand for so that I can make an informed decision. Aaaauuuggghhhh! Ok .. back to your question. I seem to be the odd person out here. As much as I love summer, I love fall even more. I love watching the leaves change from green to a kaleidoscope of reds, oranges and yellows. So, if I had any artistic ability at all, I would use every shade of red, orange and yellow to create a beautiful tree lined path, with some leaves on the ground so they would crunch under my feet. I don’t think you’re alone..once fall arrives, it is a splendid season to enjoy..apple cider and multi-colored leaves crunching under your feet, enough of a bite in the air to get out a cozy sweater..it’s a great visual!! Considering the ads get earlier and earlier just like the Halloween candy, they are also stale by the time the big event actually arrives. My easel would be a beautiful blend of colors representing the fact that we are essentially all one. Great post and I look forward to someday seeing a Crayola bomb. I love your picture!! Especially during this awful time when we are assailed with ad after contentious ad..thanks! 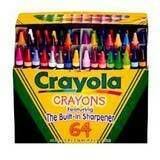 Well, we still have a Crayola 64 box with the awesome built in sharpener in the kitchen cabinet over the fridge. We have it from when my niece and nephews were little and we liked to keep a few things on hand for them. We still have sippy cups in the cabinet too. And a cow cookie jar that moos. Plastic champagne flutes and sparkling cider for all the new year’s eve parties we used to have just for them. Setting the clock three hours ahead so they could brag that they stayed up until midnight. The youngest is 19 now, but we still have that special kids cabinet. Those were gorgeously colored memories…and it was definitely a happy bomb (though one with a few bittersweet tears)…I can picture those little bodies scampering around your home..
Mimi: my fondest memories of childhood are my crayolas. Thanks for rekindling the memories. And I am in violent agreement on the political process, like a bad reality show from TV. I too have permanently barred my TV from landing on news or political channels. I loved my crayons – and was so excited each year when I got a new box (which I swore I would take good care of – NOT)…I too keep the tv off – it truly disturbs me. You’re right – it’s like some really awful reality show.